Lately I've been joking around on this blog about being a "super mom." Around the time I started doing that (earlier this year) I'd often think to myself that when my "super boy" (my twelve-year-old son with autism and kidney ailments) was born, I should have been handed a hefty manual explaining how to raise him. After all knowledge is power. So if one wants to be a super parent with a lot of power to raise a super kid with the often confounding diagnosis of autism, one has to acquire a lot of knowledge. This super mom gained a massive amount knowledge by reading tons of articles, blogs, and published books, such as Thinking in Pictures by Temple Grandin. However, it would have been nice and even time efficient if a great deal of the knowledge this super parent acquired would have been nicely assembled and packaged back around the year 2000. Today's parents of newly diagnosed super kids are a bit luckier. Obviously one book cannot reveal everything there is to know about autism, but it's nice to have a source on hand that can be consulted quickly. This super mom also suggests that this book be seen less as a "bible" and more of handbook of advice. The advice in this book should be viewed as well intentioned because this book was obviously designed to be helpful. But there are 1001 tips included in this book so not every tidbit will fit everyone. Further, some advice such as the three tips (788-790) on cutting finger nails may not suffice for those super kids with hypersensitive hearing, touch, and a sleep disorder that makes trimming nails while the person is asleep impossible. Despite that, this "super mom" does think this book is "super!!" because it was assembled with parents in mind and features tips from parents (a fun fact is that tips 974 to 976 are from a post I wrote and originally published on this blog). Other sources of tips include the likes of Grandin and Tony Attwood. One of the the best aspects is that the paperback book is affordable. At Amazon it is priced at $12.21 (U.S.). This super handbook is also organized by topic so that tips that may not apply (my child does not have problems sleeping, for example) can be easily skipped to more applicable chapters. As for me, I sped read through the diagnosis chapter and read chapters addressing puberty and sexuality much more closely. (My boy is 12, so yes I thought those tips to be most helpful). The book is also easy to read, which is a bonus for us "super parents" who are super stressed. On the bright side,there is a responsible disclaimer by the author indicating that the book wasn't written to provide parents with medical advice and that all tips were meant to merely provide information. Siri also correctly noted in his Author's note that "Autism is a spectrum, and all children with autism are different. [...] What works for one child, may not work for another." That said super parents who embrace the biomedical approach to autism will be the most likely to readily accept this book because it has a heavy emphasis on biomedical treatments. Because aspiring "super parents" who are just starting to acquire knowledge about their newly diagnosed child's disorder will most likely be reading this book too, it should be noted that the author presents all tips matter of factly and does not make mention of the controversy surrounding the belief that vaccines cause autism. This blog author prefers to regard information about vaccines cautiously and examine the arguments of both sides, so it is important to me that parents realize there are a variety of beliefs about vaccines and other biomedical treatments. Although I endorse this book, I encourage aspiring (and established) super parents to keep reading about issues, treatments and other topics regarding autism. One can never learn enough about this complicated disorder. Siri's pro-biomedical beliefs are reflected throughout the book and are not confined simply to the chapters on treatments. However, this is not surprising considering that Siri is the co-author of Cutting Edge Therapies for Autism. Despite what a parent believes about certain issues, I believe it shouldn't be passed by because the bias reflected. This book and its counterpart has loads of useful information for all parents and should be given a chance. 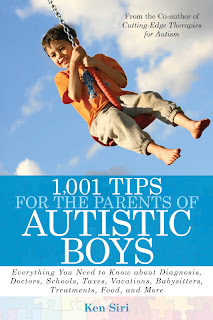 Note: This review is part of a blog tour for 1001 Tips for the Parents of Autistic Boys and its counter part 1001 Tips for the Parents of Autistic Girls. 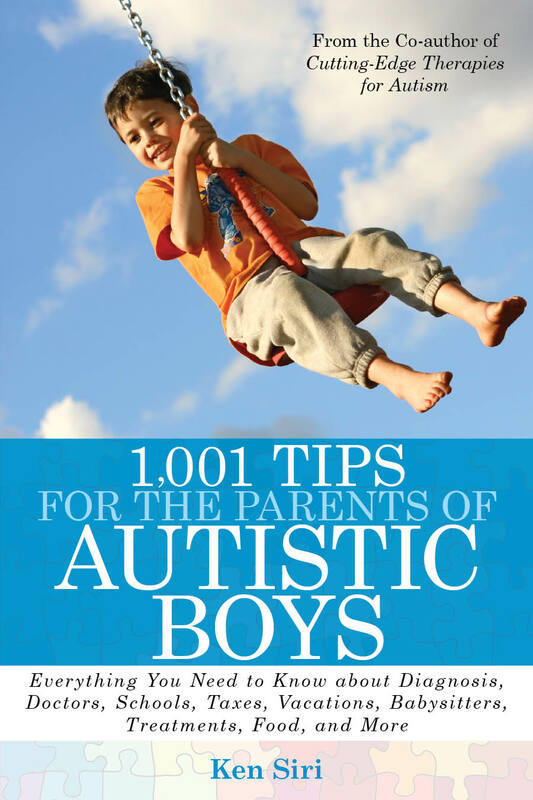 More opinions about this book (as well as the one written for girls) are available at the website 1001 tips for Autism.